Chicago Author Month: John McNally at The Bookstore in Glen Ellyn October 14, 2010! Chicagoans! I hope to see you at The Bookstore in Glen Ellyn, Il this Thursday, October 14, 2010 at 7:00. 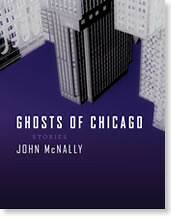 Author John McNally will be there talking about his new paperback, “Ghosts of Chicago,” a short story collection which includes a series of stories written in the voices of lost Chicago legends. So, to recap: John McNally, The Bookstore, 7:00 pm October 14, 2010. There will be wine, cheese, an awesome author, and a great independent bookstore.